Letting fans add their own little stories to a game is really cool, but there’s always a chance it might go... awry. The image quickly circulated on Twitter, prompting hurt responses from people who saw the joke as transmisogynistic. So that’s that, more or less. 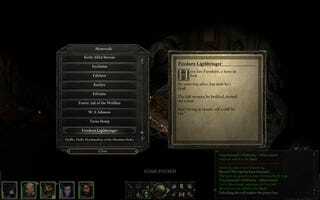 Pillars of Eternity is still the same game it was always meant to be, minus one gag that Obsidian didn’t love and wouldn’t have let slip through the cracks if they’d properly vetted it. Meanwhile, those who felt pushed away by the text’s inclusion are thankful that their voices were heard. While this sort of thing invariably raises a lot of passions (people argue and get hurt, and some even seek to hurt others, as they did—and some are still doing—here), it’s nice to see how this particular one played out. Fans spoke to Obsidian, Obsidian heard them and spoke with their backer, and everybody reached a compromise. This isn’t the first time something like this has come up in games, and I doubt it will be the last, but it’s good to see people communicating to try and make things better.